Helllooooo, all people interested in books. Waiting on Wednesday is a bookish meme hosted by Jill of Breaking the Spine in which bloggers/readers/cats tell other bloggers/readers/cats what upcoming book(s) they are anticipating. This is my first post within the WoW meme and today I’ve got a contemporary novel that I am dying to read. Release already! Please read the synopsis and tell me you are bored to tears. That’s right, you can’t. Because it sounds amazing. I haven’t wanted to get my hands on a book so desperately in ages, but when I found this one on Goodreads, I was SOLD. 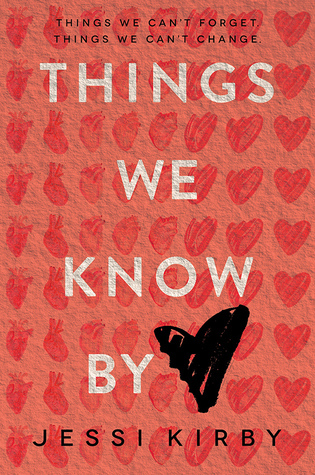 This premise, this concept, this cover- everything about Things We Know by Heart looks wonderful and unique. I’ve never read a book related to organ transplants before, nor have I wanted to until now. I predict that this will be an intensely emotional read, with a well-thought plot and lots of gush and grief to boot. April 21st, can you come any sooner? Oh, I remember this feeling. When hunger is power. When black and white is everything. When glistening sweat and sore shins mark us as different, special. Protruding bones and control are currency and I want to be rich. We trade secrets, all-or-nothings; two pounds, five pounds, as much as we can peel off ourself. And then before we know it, we’re weightless, floating on wisps of the air that we consume, made only of sunken eyes and hollow cheeks and sharp collarbones and a spine we can see as we glance behind us in the mirror, filled with paranoia. Everyone is watching as we clutch our ribs, poking and prodding through the gaps until we seize our own beating heart; mine, yours. Thump, thump, thump. It feels good at first, you and I joined together as one. The honeymoon stage, one might call it. But soon it’ll be a game of tug o’ war, lasting only seconds until it’s no longer a game but a fight to the death for one of us, maybe both of us. Neither can live while the other survives. And though I’ve kept you under reigns so far, you’re slowly creeping back from the darkest corners of my mind, seeping into my bones until you and I are conjoined once more, “as it should be,” you whisper. I haven’t spiraled yet. But still, after all these years of pushing you back and tucking you away, after all this time of folding you neatly into a chest inside my skull along with my other demons – still a part of me longs to lose control in the black hole you belong to. They don’t teach us this in school, that control and chaos are long lost twins – it is impossible to possess one without the other. I crave the rigidness you offer me, yet I know I am only a host whom you will inevitably take over. And I’m not sure yet whether I’m willing to go down that path again with you, a trip down memory lane for old times’ sake. If I do I will surely go down in flames, screaming while you smile and slither back, waiting for the next time my despair comes calling. But I cannot walk this road alone. Right now, all I know is that I don’t want it to stop, this feeling that I remember so vividly from the period I worked so hard to repress. I don’t want to forget anymore. February has been the most stressful month I’ve had in a long time. I’ve been swamped with responsibilities and work and deadlines and for most of the month I’ve felt like I’m drowning/constantly on the verge of tears. But anyway, since I haven’t had time to write any of the posts I was planning to write this month, here’s a quick summary of what’s been going on. Also, check out Taylor Swift’s Style music video (it’s artsy) and the Uptown Funk music video (it’s dancy). I have no idea if I’ll manage to get another post up this week but I’m aiming to do a February wrap-up next weekend. Bonne semaine à tous!